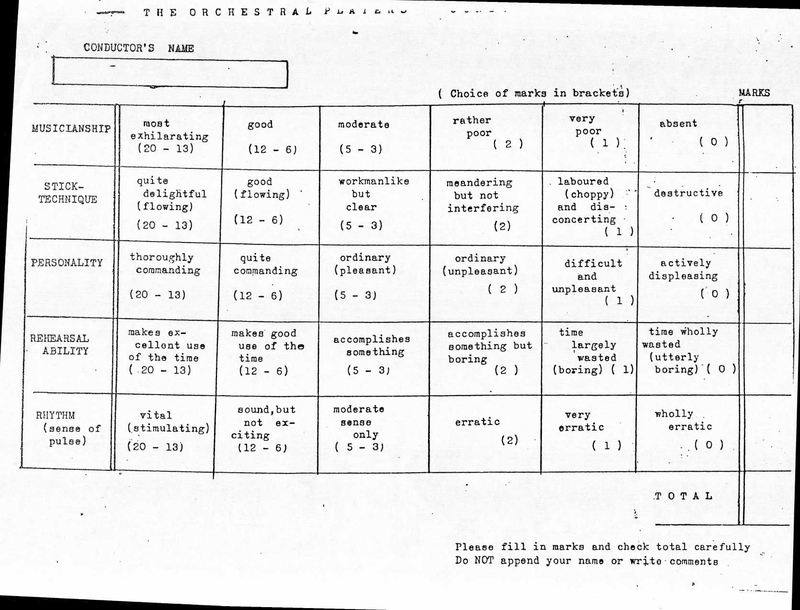 A week or so ago, I was having a discussion with a distinguished reader of All is Yar about evaluating conductors, and I was reminded of a rather amusing conductor rating survey that was circulated a few years back among members of an organization of which I was a part. The form itself was not used by us, but rather by some unknown orchestra, apparently located in European. Judging by the font and design, I’m guessing it is a few decades old or someone took great pains to make it look that way. It’s not exactly a textbook design for a survey: for example, it really makes no sense to give the best categories an eight-point range of 20-13 while only allocating a single point to each of the bottom three categories. As always, your own thoughts and comments are welcome and appreciated. Tags: conductor ratings. Bookmark the permalink.